1. Blend tomato sauce, onion, garlic, chipotle, cumin, coriander, salt, and broth in blender until smooth. Heat oil in large nonstick skillet over medium heat until shimmering. Add tomato mixture, bring to boil, reduce heat to medium-low, and simmer until mixture is reduced to 3 1/2 cups, 8 to 10 minutes. Transfer to bowl and refrigerate until cool, about 1 hour. 2. Adjust oven rack to middle position and heat oven to 300 degrees. Toss 3/4 cup sauce with chicken, 1 cup cheese, cilantro, and jalepeños. 3. Place 5 tortillas on baking sheet and lightly coat both sides with cooking spray. Bake tortillas until just pliable, about 2 minutes. Working quickly, transfer one tortilla at a time to work surface, fill with 1/3 cup chicken mixture, and roll tightly. Transfer, seam side down, to large plate. Repeat warming and rolling process with remaining 5 tortillas. 1.Place plate in freezer until enchiladas are frozen, at least 1 hour. 2. Place remaining sauce in freezer safe container and press 2 layers of plastic wrap directly onto surface of sauce. Tightly wrap enchiladas in bundles of 5, first in plastic and then in foil. Freeze for up to 2 months. 1. When ready to serve: Adjust oven rack to middle position and heat oven to 350 degrees. Defrost enchilada sauce in microwave on defrost setting, about 12 minutes. 2. Coat 13 by 9-inch baking dish with cooking spray. Arrange frozen enchiladas in single layer in baking dish and coat tops with cooking spray. Bake until tops of tortillas are just beginning to flake, about 20 minutes. 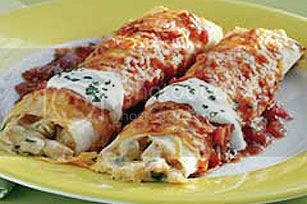 Remove dish from oven, top enchiladas with 1 1/2 cups sauce, and bake 10 minutes longer. Sprinkle enchiladas with remaining 1 1/2 cups cheese and bake until cheese melts and center of casserole is hot and bubbling, 3 to 5 minutes. I'm just getting started in the wide world of freezing food ... question. Why do you spray the tops of the enchiladas with baking spray? It doesn't sound like they'll be touching anything, so I wasn't sure why this was necessary. Just came across your site and I'm LOVING your recipes! I've made your baked ziti and the tamale pie, hubby loved! Thanks for sharing, keep up the good work! If you have found this site helpful, please donate to help Freeze Happy keep going. A new recipe will be posted each Monday and, of course, you can always search the archives by category. The Goal of this blog is not just to give you my recipes, but to teach you which ingredients freeze well, which don't, methods and tips to help you freeze your own recipes...because who knows better what your family likes than you? Do you only cook organic? Great! Are you a vegetarian? No problem! Make what works for you and save time, money and (let's be honest...stress) while doing it. The Freeze Happy philosophy has made my life better and I'm pretty sure it can improve yours too. Copyright © 2008-2010 Emilie Ahern. The content on these pages, including text and images are the sole property of the author unless otherwise noted and may not be used or reproduced in any manner without consent. All Rights Reserved.